We recently got a call at home telling us that our city is enacting water restrictions because of the lack of rainfall this summer. No irrigation systems for lawns and gardens; no hosing down driveways, cars, or home exteriors; and hand-held hose watering is confined to 5:00 p.m. or later. Our lawn is brown and crunchy, and we've restricted our son to only watering the transplanted hydroponics with a teaspoon under the light of the moon. Oddly enough, commercial car washes are good to go. My husband and I are bonding over a daily reporting of which neighbors are breaking the rules and letting their sprinkler systems water the lawn (we sneer at them righteously). It did make me think about climates where this kind of restriction is the norm, and I remembered a book I worked on when I first came to Storey, Gwen Kelaidis's lovely Hardy Succulents. Although this is really a book about how to grow succulents even in a damp zone, succulents somehow seem more at home when it's dry and warm. 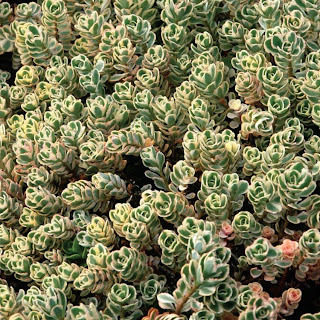 Succulents are defined as plants that hold water in their tissues, and Gwen calls them "thick, turgid, and fleshy," which sounds unbearably dirty but accurate. Many can live for months without rainfall, and most can thrive in colder climates as well. 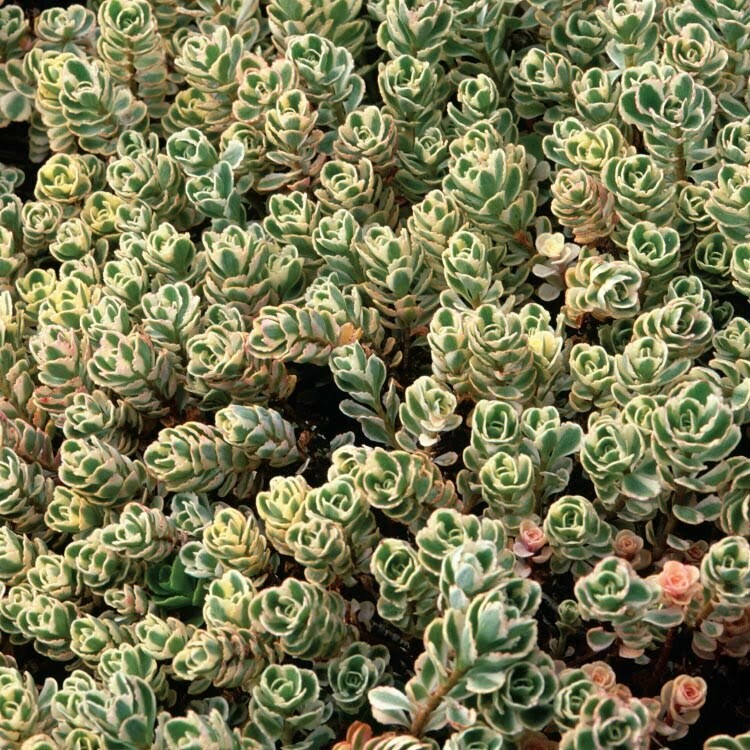 From page 65 of Hardy Succulents: Leaf shape is almost the only hint that the cultivar ‘Tricolor’ is also a Sedum spurium. It shows more pink in early spring and in late autumn; the summer’s heat turns the foliage to green and white. Water responsibly, and enjoy these last fleeting days of summer. A "lawn" full of succulents would look kind of odd. :>) Here in California we are on water restriction most summers so I guess I'm used to seeing brown lawns. The car wash I go to recycles the water - not sure what they do with the detritus from the filters though (hopefully they're disposing of it properly). Maybe that's what the car washes in your area do too?